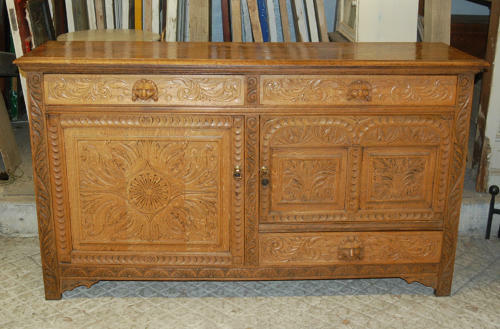 A fantastic and rare, large, French carved oak dresser base. The dresser base dates to the nineteenth century and has stunning carved detailing with acanthus leaves and decorative borders. The dresser also features beautiful carved lions head handles on each drawer. The dresser base has 3 slim drawers, and two cupboard doors with brass handles. The dresser offers plenty of storage space. The cupboard has exceptional detailing and there are attractive borders along the bottom and sides of the front face. The item has a waxed finish and the oak has a beautiful rich colour. The cupboard base is in very good, antique, condition and is solid and strong, with all drawers and doors fully working. There are some slight signs of wear, consistent with age. The top has some slight staining and there are some scratches and marks. There are light colour variations. The dresser base is a truly unique piece that is representative of the great workmanship and style of the era. The dresser base would accomodate a decorative dresser top or would look wonderful on its own. The dresser base has great stylistic value and has a large amount of useful storage. An item perfect for a period property or business.